All tickets must be purchased with accommodation as part of a package. The ticket element of this is £129 per person for earlybirds, rising to £179 per person for the final tier. Be sure to book early to lock in the best price. Can I bring children to Anjunadeep Explorations? No, Anjunadeep Explorations is an 18+ event. Are pre-sale tickets more expensive than general on-sale tickets? The pre-sale will be priced cheaper than when general sale opens. There will be a £50 difference in cost from early bird to the final tier. When and where are pre-sale tickets available? Those of you who sign up before the sign-up closes on Thursday 24th of January will have access to discounted early bird tickets prior to general sale. What benefit is there in booking early? There are limited accommodation options within the festival area and we expect these to sell out during the first few weeks. Booking early will allow you to access the best hotels and apartments in Dhërmi, for a fraction of the price. We do not expect to be releasing day tickets. You will receive your booking confirmation by email - then you will be given your wristband on arrival. I have booked my place with a deposit, how do I pay the remaining balance? One of the people in my group can no longer make it, can I change the name on the booking? When is the booking site live so I can browse hotels, flights and the boat transfer schedule? The booking website will launch when pre-sale opens at 7am GMT on Tuesday 29 January. You’ll be able to browse hotels at this time. We recommend one person book per group, so make sure you’ve worked that out in advance of pre-sale opening. More inventory will become available for general on-sale if pre-sale sells out. Why do I need to book accommodation with my ticket? All accommodation is booked via our partners, Mainstage Travel, to ensure you get the best rate. By holding all the accommodation options in advance, we’re able to not only secure the best locations for you to stay, we can also ensure the prices are fair - we’ve essentially negotiated with the whole town in advance to guarntee event attendees have access to the best accommodation possible at the best price possible. How and where do I book a flight package? Flight packages can be booked directly via the Explorations ticketing website. All flights booked through us will be to and from Corfu airport. The flights have been filtered to be in line with our transfer times and will allow transportation to be made in plenty of time to get you to your final destination. I don’t live in the EU, why can I not book a flight package via the Anjunadeep Explorations website? Unfortunately we are only able to offer short-haul, European flights. We recommend Skyscanner for finding the best fares for those who are looking for different flights. 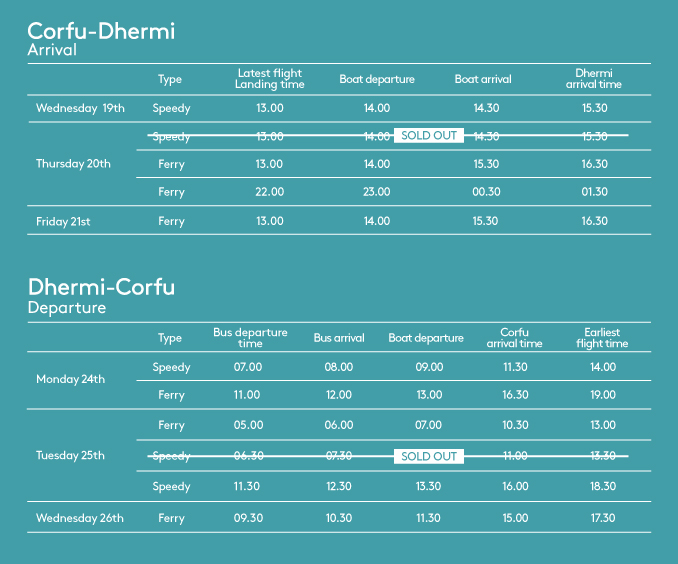 What’s the schedule for boat transfers from Corfu to the Albanian Riviera? The booking site, when live, will have a full breakdown of the available boats and transfer options. Accommodation is located in and around the Dhërmi Beach and Drymades Beach areas. The official Explorations shuttle will run throughout the festival, its the easiest and cheapest way to get around, and you can book your pass in advance. What’s the cancelation policy for the ticket, hotels and flight? All tickets come packaged with accommodation. There’s a range of options available to suit all budgets, ranging from exotic beach huts to shared rooms to four star hotel suites. You’ll be able to browse the full range of accommodation available via our booking portal when pre-sale opens on January 29 at 7am GMT. Pre-sale sign up is now closed. I’d like to reserve a hotel room / rooms but I need to more time to get my group together. Can I hold the rooms and provide Anjunadeep Explorations with names at a later date? We cannot reserve rooms for you but there will be plenty of great packages on offer should you need to wait for the group before you book! Where do the boat transfers leave from? On the way to Explorations, from Corfu Port. On the way back, from Himara port. I’m arriving early and there are no Explorations transfers available, what should I do? The earliest flight landing times in to Corfu are approximately 10:30am -11:00am, with the first boats leaving around 14:00. This means the maximum amount of time waiting should be two hours, allowing for travel time to Corfu Port from the Airport. The perfect amount of time to grab a beer and some lunch! Mainstage Festivals are our partner on the event. They currently run the successful Kala Festival and Snowboxx Festival. All Mainstage Festivals events include travel and accommodation, so you can rest assured you are in safe hands here. Read about Kala festival, which is held at the same location, to get a better sense of the experience on offer in The Guardian and on Resident Advisor. Absolutely! Not only is Albania completely safe place to visit (they will likely join the EU in the next few years) but you will find the best hospitality in the Mediterranean. Albanians are very proud of their country and genuinely happy to go out of their way to spoil a visitor. They can become your unexpected guides, translators or even invite you to their homes. Get ready to try the local Rakı! There’s plenty to do and see on the Albanian Riviera! Keep an eye on the event website and Explorations social media channels for details on experiences you can purchase including snorkelling, paragliding, kayaking, day trips and hikes plus a full wellness program including daily yoga. Note that some activities will attract an additional fee, more information on that over the coming months. I’m from the UK, should I be concerned about Brexit? Will there by WiFi available anywhere in Dhërmi? Yes, most of the local restaurants have wifi networks you can connect to. If your plan has EU roaming included, you will be able to connect to the Greek networks and use your normal data allowance. How much will calls and texts cost me in Albania? This depends on your network provider. The best network for Albania is Vodafone. Can I use Euros in Albania? No - the local currency is Lek. Some venues might quote prices in Euros, however, and there’s cashpoints in town. Many bars and restaurants accept card. Explorations is a zero tolerance festival. Is it safe to drink the tap water in Albania? According to FCO, the tap water in Albania may cause illness - you should drink only bottled water. If you drink milk, make sure it is UHT (pasteurised). Will there be vegetarian and vegan food on offer? Yes, indeed there will be! How much will food and drink cost me at the festival? How hot is it in Dhërmi? The average temperature for the end of June is a glorious 28 degrees celsius! What is the disability access to the festival? The festival is located across a series of beaches and dance platforms across the coast of Dhermi. There is limited access to some areas of the festival due to the nature of the site, however the staff on site will be on hand at all times to assist guests to get them into positions where they are able to enjoy and view the music and artists performing. Please get in touch with the team to find out more. There are no camping options for Explorations, sorry! Please don’t bring your own alcohol to the festival, we’ll have plenty! Set times for all stages will be revealed over the coming months. I am from Albania, are local tickets available? Discounted price Albanian tickets will be available nearer the time. Do I have to pay extra for yoga / meditation? No, this is included within the price of your ticket. I work for a media outlet, can I please cover the event? What is the time difference from the UK? We will be releasing roles nearer the time - please keep an eye on our Instagram page! These will be released in the lead up to the event.